The organisers of the agricultural Moreton-in-Marsh Show have unveiled important changes to the Farms and Crops Schedule. A new class has been created for Organic Farms, and there is also a new class for a Working Stock Bull. 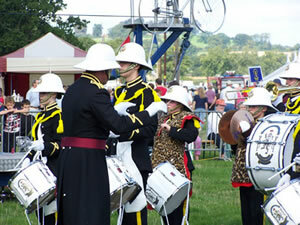 The annual Moreton-in-Marsh Show has announced plans to slightly move the location of the 2009 show ground. Saturday 9th August 2.30pm The Washbrook Barn, Ebrington, Gloucestershire. Everything you’d expect from a village show – and more! This is the 28th Annual Flower and Vegetable Show and is held at The Washbrook Barn in Ebrington, by kind permission of The Drinkwater Family. A traditional show with something for everyone. There are 112 Classes covering Vegetables, Flowers, Fruit, Floral Art, Children’s Classes – under Five Years, Five to Eight Years and Nine to Twelve Years,- Cookery, Wine, Photography and Craft Work.